Our robot nursery pictures featuring the latest in robot bedding are something that geeks and the techie types will not want to miss. If the daddy-to-be ever had dreams of becoming an astronaut or simply loves to tinker with electronic gadgets, this nursery design may be exactly what you're looking for. 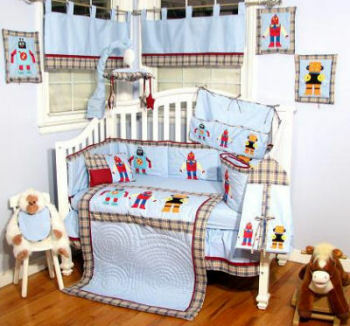 A robot theme may seem unusual to as the idea of robot nursery bedding sets in a baby's nursery is rather new. But even the most reluctant newcomers have come to see this theme's decorative possibilities. The fabric of the robot bedding may be mechanical, but anything but dull. These friendly robots are bright orange, teal blue and red surrounded with lively designs making them the height of fashion. Lately, robots have been popping up in outer space nursery themes and are also a huge success in older boys bedrooms decorated with Disney and Pottery Barn Kids robot themed bedding sets. What little boy wouldn't love to room with the giant robot from the black and white television series "Lost in Space"? So, why should we not give our mechanical friends a chance starting in a baby boy's nursery? Will, the youngest of the characters, had great affection for his mechanical friend and I thought he was pretty cool, too. If you would like your children to develop a relationship with Cyborgs and Bionic beings, here are some cute decorating ideas and robot bedding sets that will send them in that direction. If we won’t be using robot print fabrics to anchor and provide the outline for our nursery’s color scheme, you will need to get the robotic message across by using decorative accessories. 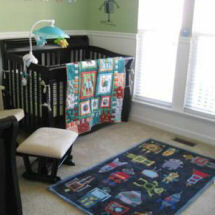 Since this is a unique theme you will most likely have to be very creative in accessorizing your robot bedding for the baby’s crib. This may be the time to approach dad about the possibility of borrowing his toy robots to display on a wall shelf. Assure him that if he allows you to use his precious collectibles as nursery wall decorations that you will be certain that they are well out of your baby’s reach. For your baby safe robot decorations, sew some throw pillows in robotic shapes that will reflect the colors in your robot bedding set that decorates the baby crib so beautifully. We are now educated to the fact that robots are our friends, but not so long ago we associated them with outer space. Outer space murals designed using planet wall decals with framed robot or outerspace robot or alien pictures and old space movie posters would be in keeping with your robot baby boy nursery theme. 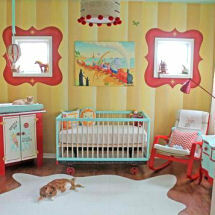 The key to this kids’ bedroom design as with any is balance. There is a fine line between decorating a stylish, safe and comfortable room and one that resembles a store with products lined up for sale. A few robots, spaceships and outer space motifs are all that will be needed to successfully compliment your contemporary robot bedding set. With the right selection of wall art and decorations, this is a bedroom that can be educational as well as entertaining for both father and son. Return to find more robot themed baby nursery ideas for girls and boys and bedding for futuristic, geeky nursery designs.